East Ocean Restaurant Clarkston review, pics, hours, and menu info. East Ocean serves Chinese food, Thai food, and some sushi on Sashabaw road in Clarkston MI. The interior of East Ocean was clean and quite interesting. Cozy with booths and not overly cheesy or gawdy. It was more spacious than most Chinese restaurants, with plenty of seating. We first went to East Ocean because we were in the mood for some sushi. Unfortunately, we didn’t get to try the sushi since we went so late that the sushi chef had already left for the day. So, we had to explore the East Ocean Restaurant Clarkston menu. The East Ocean menu includes a small sushi selection, Chinese food, and Thai food. With our food sensitivities, our waitress was totally knowledgeable about what was in each dish. She was able to help us find something on the menu that did not include soy sauce. 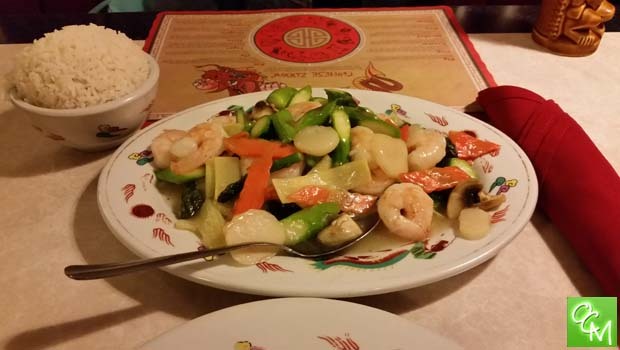 We ended up trying a Chinese dish… shrimp and asparagus. It was actually quite good with a light sauce and plenty of fresh vegetables. The staff was incredibly honest and kind, and guided us toward this option meanwhile talking us out of others. The asparagus was cooked perfectly with a slight crunch. I was worried since I’ve ordered asparagus at restaurants before and it has come out mushy and stringy… totally overcooked and disgusting. This was awesome. The food at East Ocean is a bit pricey. I can only speak for the Chinese food, which I thought was done well. However, I don’t know if one restaurant can master Chinese food, Sushi, and Thai food. I know that they use soy in the Pad Thai (something you don’t see everywhere) and I was unable to try it. The drinks menu at East Ocean Clarkston was insane. A full-page of the East Ocean Restaurant menu is dedicated to exotic mixed drinks… many of which I had never heard of. We tried a couple and they were wicked strong, but great. The drinks started at $3.95, and all were reasonable priced. You’ll see in the pics that they are a decent size as well. Mine was basically served in a large round glass that resembled an over-sized soup bowl! I had one drink and that was all I needed! Because the staff was so helpful and the drink menu was so awesome, I think I may add this to a nice place meet up with my best friend.